The Holidays are much brighter for Clarence Brown after he got just the gift he wanted …a full-time job. 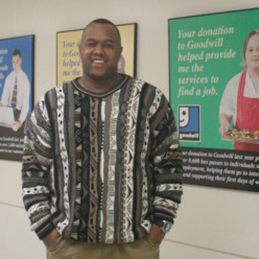 Clarence’s journey started when he was referred to Goodwill's Career Impact Program. He had a number of barriers to overcome. Not only was he homeless but he struggled with reading due to a learning disability. His Goodwill Career Navigator points to low self-esteem as Clarence’s biggest barrier. “He just didn’t think he was good enough. I had to talk him up for quite some time so that he could realize his potential.” That encouragement plus hands-on, one-on-one help filling out applications online and practicing mock interviews eventually paid off. Clarence earned a part-time job at Lowe's making $11 an hour. Still, he says, the help from Goodwill didn’t end there. Clarence continued looking, finding leads and filling out online applications at the Goodwill GoodWORKS Career Center in downtown Kansas City. A few weeks later he received and accepted another part time job offer, this one from Hy-Vee making $10 an hour. Before long, impressed by his work ethic, Hy-Vee offered him a full-time position with a $3 raise and benefits. With a full-time job, now Clarence has a stable home and transportation of his own. Most importantly to him, he can provide for his three children and visit his youngest daughter who lives in Michigan. We can see the difference the Power of Work has made in Clarence’s life. “At first, his self-esteem was so low he’d hang his head,” says his career navigator. “He blossomed. It was amazing to watch.” Now Clarence is mentoring others paying forward the assistance he received.